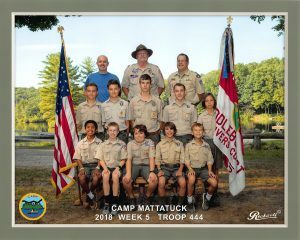 Troop 444 is located in Middlebury, CT, and is chartered by the Middlebury Police Social Club. Based in Middlebury, CT, Troop 444 offers a year-round adventure-based program designed to offer and encourage effective character, citizenship, community service, scout-craft and outdoor training and skills for boys in grades 6 to 12. In addition to camping, scouts and adult leaders enjoy activities such as biking, rock-climbing, summer camp, rafting, fishing and more—while accommodating the needs of today’s busy families. Our troop was founded in 1959 and is sponsored by the Police Social Club. Since the Troop was charted we have had over 74 Scouts achieve the rank of Eagle. Our Eagle projects have been as diverse as our boy’s interests—helping local organizations, schools, churches and charities. Our current scoutmaster is Fran Barton, Jr., who earned his Eagle rank while in Troop 444 in 1975. Our Assistant Scout Master, John Holmes, is also an Eagle Scout. Troop 444 is a boy-led troop, but our committee works with the boys to ensure fun, safe and organized events, trips and meetings.